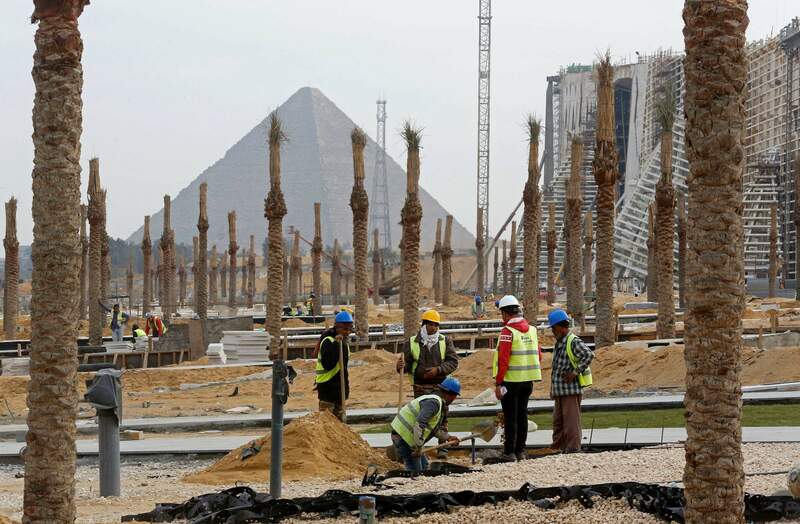 Workers landscape grounds at the Grand Egyptian Museum under construction in front of the Pyramids in Giza, Egypt. Thousands of Egyptians are laboring in the shadow of the pyramids to erect a monument worthy of the pharaohs. 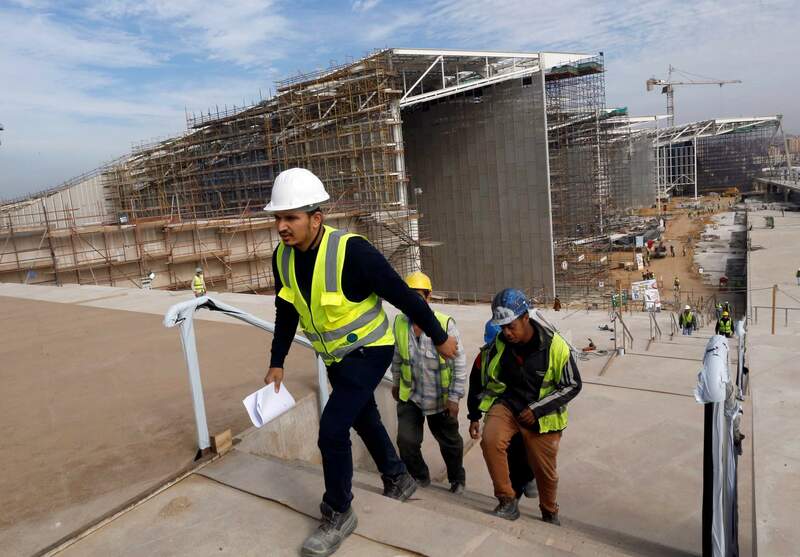 The Grand Egyptian Museum has been under construction for well over a decade and is intended to show off Egypt’s ancient treasures while attracting tourists to help fund its future development. 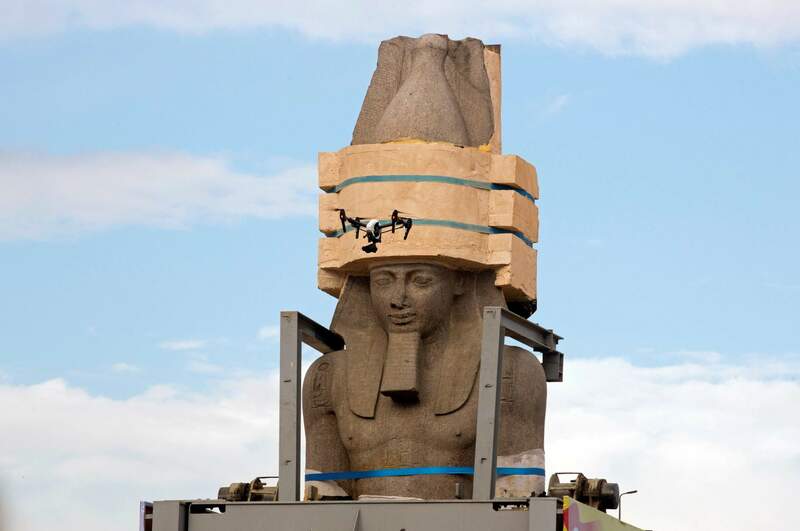 A drone flies around a giant statue of the pharaoh Ramses II in January 2018 as it is relocated to the Grand Egyptian Museum, in Cairo, Egypt. CAIRO – On the Giza Plateau outside Cairo, thousands of Egyptians are laboring in the shadow of the pyramids to erect a monument worthy of the pharaohs. Work continues in the shadow of a statue of Pharaoh Ramses II, at the Grand Egyptian Museum, under construction in Giza, Egypt. Thousands of Egyptians are laboring in the shadow of the pyramids to erect a monument worthy of the pharaohs. The museum is a series of towering concrete halls that will eventually hold some 50,000 artifacts, including the famed mask of Tutankhamen – popularly known as King Tut – and other treasures currently housed in the century-old Egyptian Museum in Cairo’s congested Tahrir Square. The hope is that tourists will stay awhile, and provide the foreign currency Egypt needs to buttress its economy. 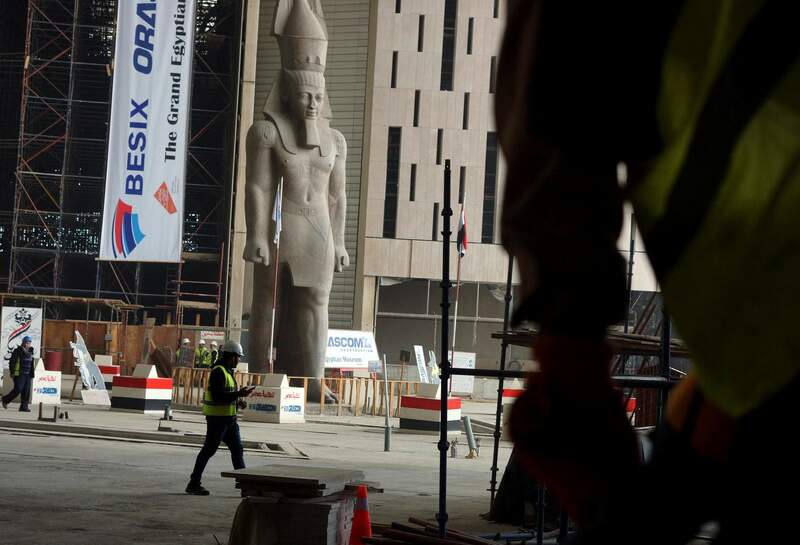 Construction workers talk in front of a statue of Ramses II, a 3000-year-old Pharaoh of Egypt, at the Grand Egyptian Museum under construction in Giza, Egypt. El-Sissi has meanwhile sought to use large-scale projects to bolster the image of the state – with mixed results. A trumpeted expansion of the Suez Canal in 2015 has yet to deliver the soaring revenues the government promised, as global trade has eased. A grandiose new administrative capital under construction outside Cairo is still in the early stages, with negligible foreign investment and foreign embassies not keen to move so far out into the desert. 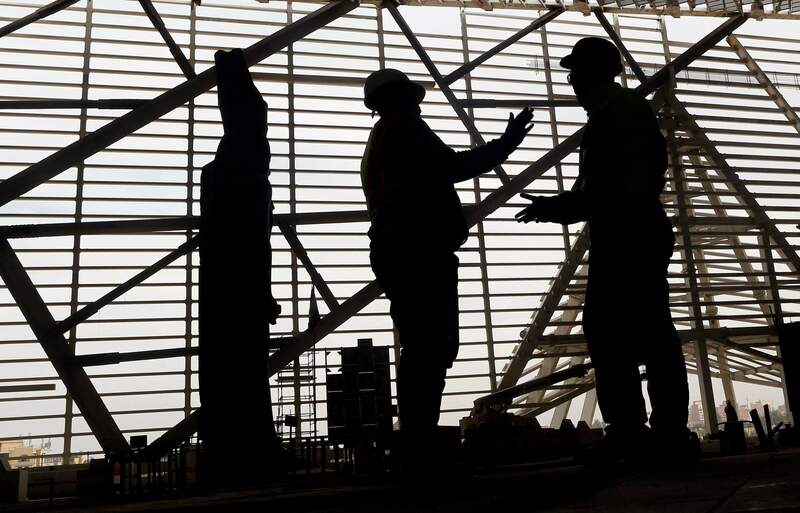 Workers go for a break at the Grand Egyptian Museum under construction in Giza, Egypt. Thousands of Egyptians are laboring in the shadow of the pyramids to erect a monument worthy of the pharaohs. 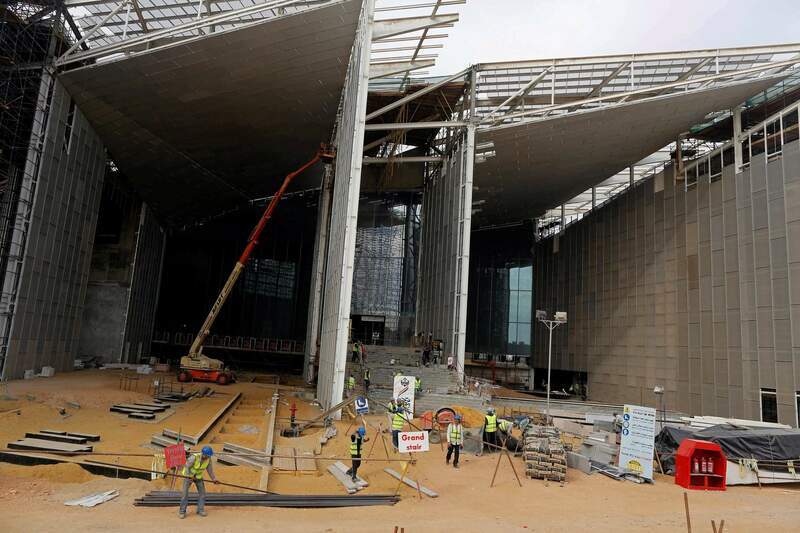 Work continues at the Grand Egyptian Museum under construction in Giza, Egypt. Thousands of Egyptians are laboring in the shadow of the pyramids to erect a monument worthy of the pharaohs.